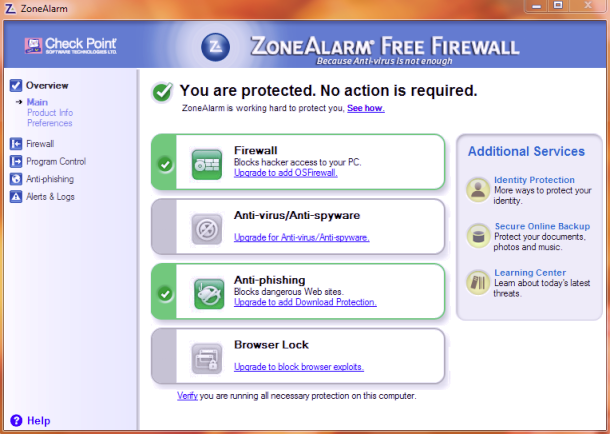 Is ZoneAlarm Free Firewall 2010 The Best Firewall For You? 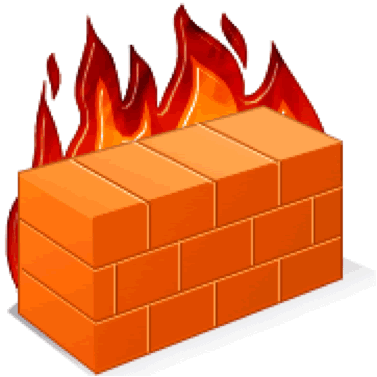 I’m always surprised when I get asked “The Firewall” question – why do I need one? The answer is always the same – a Firewall, either Hardware or Software, is designed to block unauthorized access to your computer from the Internet, at the same time permitting protected authorized communications – provided it includes outbound protection. Most casual users that I come into contact with believe that Firewalls need to be expensive to ensure that they get the job none. But, that’s not always the case. ZoneAlarm, for example, is a very robust, uncomplicated, free Firewall, which is non- intrusive, and very appropriate for casual computer users – and gets the job done. 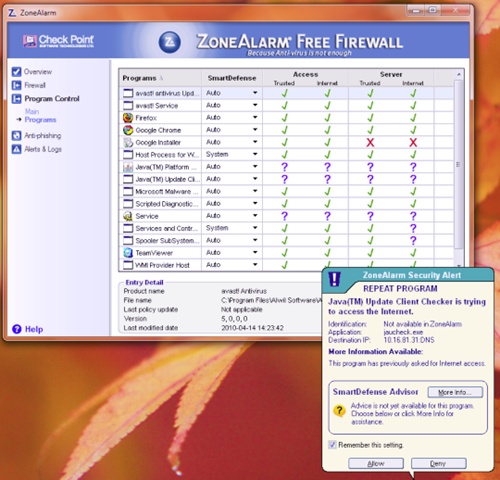 ZoneAlarm Free (last updated November 23rd, 2010), was the first Firewall I installed on a personal system, and that was back in the early days of Internet connectivity – 1996. 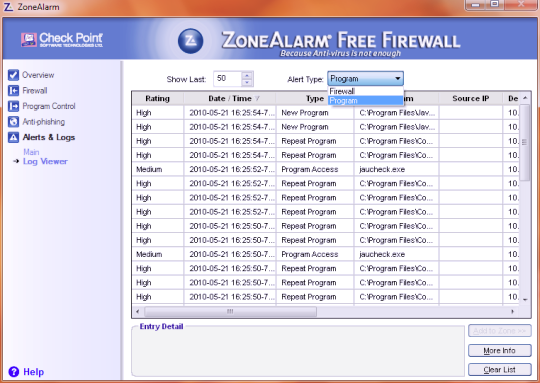 After all these years, ZoneAlarm Free continues to be my all time favorite free Firewall. In my 14 years of experience with ZoneAlarm Free, never once has it let me down. It’s the least intrusive free Firewall that I’m aware of – Firewalls that demand attention every 5 minutes drive me crazy! It provides strong inbound intrusion detection, coupled with strong outbound protection. Outbound protection is an absolute “must have” today, since the botnet threat continues to escalate. ZoneAlarm will prohibit botnet connections. ZoneAlarm’s “stealth mode” keeps my computer invisible on the Internet. If I can’t be seen by cybercriminals, my risk exposure is reduced substantially. 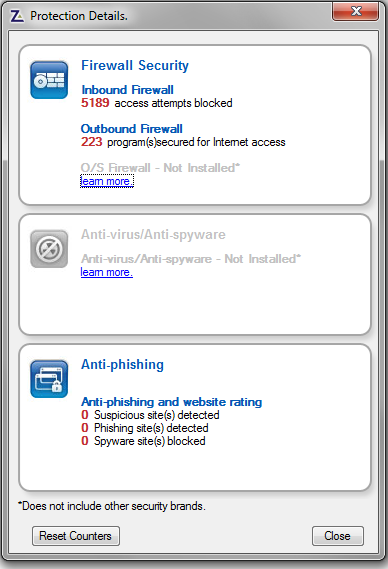 ZoneAlarm Free continuously monitors Internet activity through its True Vector Internet Monitor, and notifies me with an alert if it detects an unsafe, or disallowed activity. DefenseNet – Leverages real-time threat data from community of millions of users to detect and block the latest attacks. Inbound Firewall Protection – Stops hackers and other intrusions by making your PC invisible online. Outbound Firewall Protection – Blocks spyware, botnets, and other malware from sending your personal data out to the Internet. Quiet and Automatic – Runs in the background, un-noticed and out of the way, with rare alerts. Anti-phishing and Site Check – Toolbar blocks fraudulent websites including those that trick you into entering personal data. Identity Guard – Provides credit scores and recovery services to secure your identity online and offline. Works with all Antivirus – Compatible with antivirus software, such as AVG and Norton Antivirus. The program settings screen is definitely new user friendly, as the following graphic illustrates. The graphic below illustrates a security popup since a new application is seeking first time access to the Internet. Users have the opportunity to allow, disallow, and with a checkbox tick, have ZoneAlarm automatically remember the response. The activity log can be particularly valuable for more experienced users. ZoneAlarm’s default settings are well thought out, and provide excellent protection for less experience users particularly – and despite the hype put out by media, most computer user can be classified as having limited system experience. Experienced users on the other hand, can tinker to their hearts content, customizing and tweaking the application to meet their specific requirements. 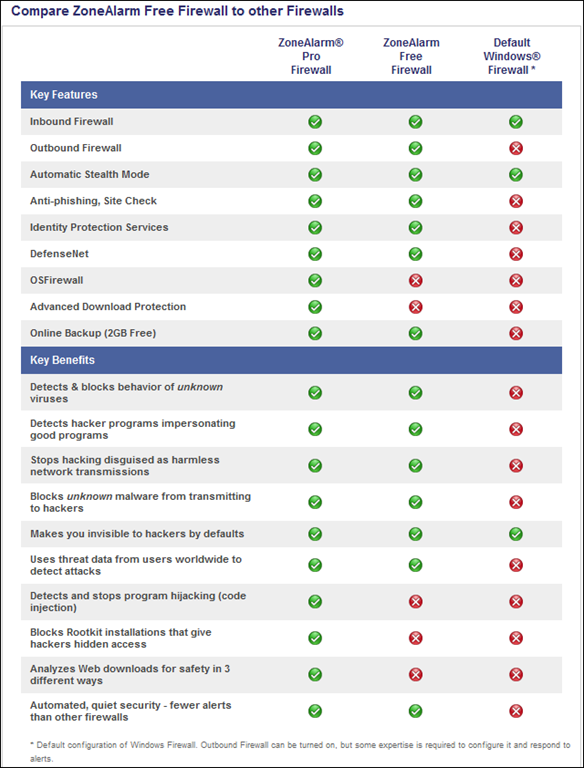 If you are a casual computer user, ZoneAlarm Free is definitely worth considering as a new Firewall installation, or as a replacement for a current Firewall that is not meeting your expectations. The following graphic illustrates ZoneAlarm’s protection details, on one of my systems, over a 60 day period. System Requirements: Windows 7 (32-bit/64-bit ), Vista, XP SP2 or SP3. Download at: the developer’s site (Check Point Software). Note: Test your existing Firewall at Steve Gibson’s site – ShieldsUP! If your current Firewall is not in stealth mode (this test will confirm it), and if it can’t be forced into stealth mode, then you should consider changing your Firewall application. this application (use the applications built-in uninstaller), before installing ZoneAlarm Free. I mention this as a precaution only, since it’s as likely that you won’t encounter any difficulties. But…….. If your current Firewall does not include a built-in uninstaller, then use Revo Uninstaller which will delete the application including the applicable Registry entries. ZoneAlarm Free was the first Firewall I ever installed to a personal system, and that was back in the dark ages of 1996. It wasn’t until 2009 that I was reluctantly forced to move away from the world’s most popular free Firewall, since Windows 7 was not yet supported. Happily, Windows 7 is now supported, and I’ve jumped at the chance to reinstall my absolute all time favorite free Firewall. On the reinstall it installed easily, set up quickly, and has not caused any conflicts with my machine – despite my sometimes esoteric running requirements. The default settings are well thought out, and provide excellent protection for less experience users particularly – and despite the hype put out by media, most computer user can be classified as having limited system experience.